Special 8-3 is the third level of Special 8 in Super Mario 3D Land. It is based off of World 5-Castle. The player starts off on a platform, which they must ascend to get to some platforms that move across the lava. 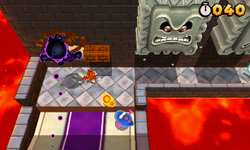 After this section is an area with some Draglets and Thwomps before another section with platforms that move across the lava. These platforms lead to more platforms and then a section where the player must use the Big Cosmic Clone to destroy the pillars before they can get to the Warp Box that leads to the Goal Pole. Star Medal 1: This first Star Medal is found floating above a platform that sinks into lava. Star Medal 2: The second Star Medal is found floating on a fence next to a Thwomp. Star Medal 3: The third Star Medal is located inside some pillars that the Big Cosmic Clone needs to destroy.